Inguinal hernias occur when part of the intestine protrudes through a weak spot in the abdomen — often along the inguinal canal, which carries the spermatic cord in men. Inguinal hernias occur when soft tissue — usually part of the intestine — protrudes through a weak point or tear in your lower abdominal wall. The resulting bulge of this common condition can be painful — especially when you cough, bend over or lift a heavy object. In many people, the abdominal wall weakness that leads to an inguinal hernia occurs at birth when the abdominal lining (peritoneum) doesn't close properly. Other inguinal hernias develop later in life when muscles weaken or deteriorate due to factors such as aging, strenuous physical activity or coughing that accompanies smoking. Although far more men than women have inguinal hernias, no one is immune — including infants, pregnant women and older adults. Not necessarily dangerous in themselves, inguinal hernias can lead to life-threatening complications. For this reason, your doctor is likely to recommend surgical repair of a hernia that's painful or becoming larger. The good news is that it's not the same hernia operation your father may have had with a large abdominal incision, a long hospital stay and weeks of immobility. Instead, many inguinal hernias now can be successfully repaired with a technique that uses several small incisions, leading to a faster, less painful recovery. Some inguinal hernias don't cause any symptoms, and you may not know you have one until your doctor discovers it during a routine medical exam. Often, however, you can see and feel the bulge created by the protruding intestine. The bulge is usually more obvious when you stand upright, especially if you cough or strain. About five in every 100 children have inguinal hernias. Inguinal hernias in newborns and children result from a weakness in the abdominal wall that's present at birth. Sometimes the hernia may be visible only when an infant is crying, coughing or straining during a bowel movement. In an older child, a hernia is likely to be more apparent when the child coughs, strains during a bowel movement or stands for a long period of time. Some inguinal hernias have no apparent cause. But many occur as a result of increased pressure within the abdomen, a pre-existing weak spot in the abdominal wall or a combination of the two. In men, the weak spot usually occurs along the inguinal canal. 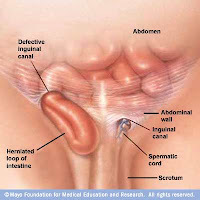 This is the area where the spermatic cord, which contains the vas deferens, the tube that carries sperm, enters the scrotum. In women, the inguinal canal carries a ligament that helps hold the uterus in place, and hernias sometimes occur where connective tissue from the uterus attaches to tissue surrounding the pubic bone. Men are more likely to have an inherent weakness along the inguinal canal than women are because of the way males develop in the womb. In the male fetus, the testicles form within the abdomen and then move down the inguinal canal into the scrotum. Shortly after birth, the inguinal canal closes almost completely, leaving just enough room for the spermatic cord to pass through, but not large enough to allow the testicles to move back into the abdomen. Sometimes, however, the canal doesn't close properly, leaving a weakened area. There's less chance that the inguinal canal won't close after birth in female babies. In fact, women are more likely to develop hernias in the femoral canal, an opening near the inguinal canal where the femoral artery, vein and nerve pass through. Weaknesses can also occur in the abdominal wall later in life, especially after an injury or certain operations in the abdominal cavity. Whether or not you have a pre-existing weakness, extra pressure in your abdomen can cause a hernia. This pressure may result from straining during bowel movements or urination, from heavy lifting, from fluid in the abdomen (ascites), and from pregnancy or excess weight. Even chronic coughing or sneezing can cause abdominal muscles to tear. You're far more likely to develop an inguinal hernia if you're male. Nearly 10 times more men than women have inguinal hernias, and the vast majority of newborns and children with inguinal hernias are boys. Family history. Your risk of inguinal hernia increases if you have a close relative, such as a parent or sibling, with the condition. Certain medical conditions. Having cystic fibrosis, a life-threatening disorder that causes severe lung damage and often a chronic cough, makes it more likely you'll develop an inguinal hernia. Chronic cough. A chronic cough, such as occurs from smoking, increases your risk of inguinal hernia. Chronic constipation. This leads to straining during bowel movements — a common cause of inguinal hernias. Excess weight. Being moderately to severely overweight can put extra pressure on your abdomen. Pregnancy. This can both weaken the abdominal muscles and cause increased pressure inside your abdomen. Certain occupations. Having a job that requires standing for long periods or doing heavy physical labor increases your risk of developing an inguinal hernia. Premature birth. Infants who are born sooner than normal are more likely to have inguinal hernias. History of hernias. If you've had one inguinal hernia, it's much more likely that you'll eventually develop another — usually on the opposite side. See your doctor if you have a painful or noticeable bulge in the area on either side of your pubic bone. The bulge is likely to be more noticeable when you're standing upright, and you usually can feel it if you put your hand directly over the affected area. You should be able to gently and easily push the hernia back into your abdomen when you're lying down. If not, applying an ice pack to the area may reduce the swelling enough so that the hernia slides in easily. Lying on a slant with your pelvis higher than your head also may help. If you still aren't able to push the hernia in, the herniated intestine may have become trapped (incarcerated) in the abdominal wall — a serious condition that may require immediate medical attention. This condition may be accompanied by nausea, vomiting or a fever and a hernia that turns red, purple or dark. If any of these signs or symptoms occur, call your doctor right away. A physical exam is usually all that's needed to diagnose an inguinal hernia. Your doctor is likely to ask about your signs and symptoms and to check for a bulge in the groin area. Because coughing can make a hernia more prominent, you may be asked to cough or strain as part of the exam. Most inguinal hernias enlarge over time if they're not repaired surgically. Large hernias can put pressure on surrounding tissues — in men they may extend into the scrotum, causing pain and swelling. But the most serious complication of an inguinal hernia occurs when a loop of intestine becomes trapped in the weak point in the abdominal wall. This may obstruct the bowel, leading to severe pain, nausea, vomiting and the inability to have a bowel movement or pass gas. It can also diminish blood flow to the trapped portion of the intestine — a condition called strangulation — that may lead to the death of the affected bowel tissues. A strangulated hernia is life-threatening and requires immediate surgery. Herniorrhaphy. In this procedure, your surgeon makes an incision in your groin and pushes the protruding intestine back into your abdomen, then repairs the weakened or torn muscle by sewing it together. After the operation, you'll be encouraged to move about as soon as possible, but it may be as long as four to six weeks before you're able to fully resume your normal activities. Hernioplasty. In this procedure, which is something like patching a tire, your surgeon inserts a piece of synthetic mesh to cover the entire inguinal area, including all potential hernia openings. The patch is usually secured with sutures, clips or staples. Hernioplasty can be performed conventionally, with a single long incision over the hernia. But it's often done laparoscopically, using several small incisions rather than one large one. A fiber-optic tube with a tiny camera is inserted into your abdomen through one incision, and miniature instruments are inserted through the other incisions. Your surgeon then performs the operation using the video camera as a guide. Advantages of laparoscopic repair include less discomfort and scarring after surgery and a quicker return to normal activities — most people are back to work within a few days. The procedure is a good choice for people whose hernias recur following traditional hernia surgery because laparoscopic methods allow surgeons to work around scar tissue from earlier repair. It's also good for people who have hernias on both sides of the body (bilateral inguinal hernias). You may not be a candidate for laparoscopic hernia repair if you have a very large hernia, if your intestine is pushed down into the scrotum or if you've had previous pelvic surgery such as a prostatectomy. Maintain a healthy weight. If you think you may be overweight, talk to your doctor about the best exercise and diet plan for you. Emphasize high-fiber foods. Fresh fruits and vegetables and whole grains are good for your overall health. They're also packed with fiber that can help prevent constipation and straining. Lift heavy objects carefully or avoid heavy lifting altogether. If you have to lift something heavy, always bend from your knees, not at your waist. Stop smoking. In addition to increasing your risk of serious diseases such as cancer, emphysema and heart disease, smoking often causes a chronic cough that can lead to or aggravate an inguinal hernia. Don't rely on a truss for support. Contrary to what you may have heard, wearing a truss isn't the best long-term solution for an inguinal hernia. A truss won't protect against complications or correct the underlying problem, although your doctor may recommend wearing one for a short time before surgery.